The Array of Things (AoT) is a network of interactive, modular sensor boxes that collect real-time data on a city’s environment, infrastructure, and activity for research and public use. The goal of the project is to better understand the natural and built environment of the city and its impact on livability with respect to climate, air quality, noise, and other factors -- effectively creating a "fitness tracker". AoT intends to operate as a “national instrument” for urban science and technology research, ranging from technology to social sciences and education, and will make all data open and available so that residents, software developers, scientists, and policymakers can work together to make cities healthier, more livable, and more efficient. The cyberinfrastructure, technologies, and tools used to make the rich set of urban open data available were designed primarily to support the analysis of individual data sets rather than exploring relationships among many data sets. Consequently, urban scientists lack the tools and infrastructure to fully harness urban data for their research. 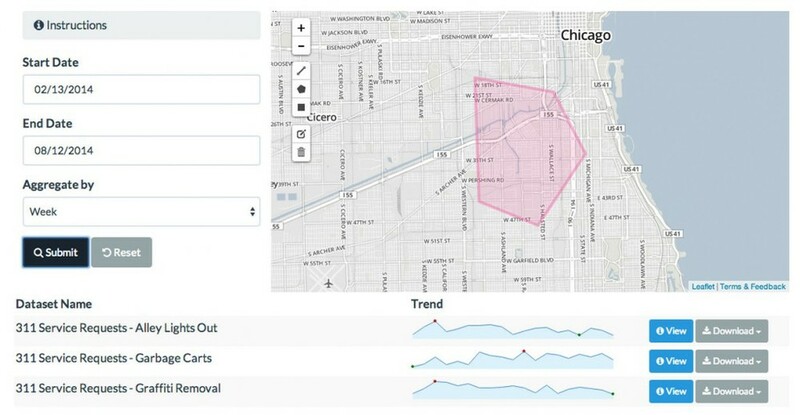 UrbanCCD researchers, in partnership with researchers at the Harris School of Public Policy, developers at DataMade, and City of Chicago officials, have developed Plenario, a a new platform for accessing, combining, downloading, and visualizing datasets released by city, county, state, and federal governments. Plenario, currently in alpha, enables scientists to select a geographic area, determine what data is available about that area, and extract an integrated collection of selected data sets for a particular time period for further analysis. The prototype exploits the fact that the bulk of published urban data sets share the attributes of location and time. By integrating data across multiple data sources, for specific time periods, for specific geographic areas, Plenario enables scientists to apply the tools of mathematics and computation to better understand urban challenges, ranging from youth violence and crime to graduate rates to employment and economic decline and revitalization. In 2012, the City of Chicago's Department of Innovation and Technology (DoIT), created WindyGrid, an internal real time situational awareness data system for major events such as the May 2012 NATO summit in Chicago. UrbanCCD researchers are working with DoIT to evaluate the scalability and performance limits of this system, creating a clone at UChicago for performance testing. A proposal from the City of Chicago, UrbanCCD, and Carnegie Melon University to extend and expand this internal situational awareness system received a $1M award from the Bloomberg Foundation Mayor's Challenge in early 2013. UrbanCCD's role is to explore architectures and approaches to (a) scaling the capacity of the system, (b) accommodating much larger transaction rates to support additional users, and (c) enabling continuous retraining of machine learning algorithms to support predictive analytics. The predictive analytics platform will provide City personnel with the ability to more efficiently, effectively, and accountably deploy City resources and deliver services to address public safety and social challenges more proactively than ever before. The platform’s potential impact includes crime reduction and prevention, preventative human service strategies on subjects ranging from public health to homelessness, infrastructure maintenance, and the delivery of core services. The ability to automatically analyze city data in real-time will enhance Chicago’s responsiveness to its residents. If executed well, it will result in faster services, reduced costs, and in some cases, saved lives. Urban developers are increasingly faced with the need to design projects at massive scales, beyond the experience of designers and the capacity of existing tools, such as the 600-acre Chicago Lakeside Development project on Chicago’s South Side. UrbanCCD and its partners are developing a general-purpose open workflow framework, LakeSim, to integrate city design/configuration tools with computational modeling tools. By adapting scientific simulations used to model energy demand and supply, environment and climate, or infrastructure to the appropriate scale, LakeSim will improve the ability of Lakeside designers to explore the impacts of changes to design and engineering, zoning, and other aspects of urban design. In contrast to one-time, customized integration of specific tools, LakeSim's open workflow framework is intended enable the incorporation of an array of tools over time. When completed, LakeSim will allow planners and developers to explore a wider range of designs more quickly, without the lengthy periods of re-analysis currently required for each aspect of the development when a new strategy is proposed. The Urban Sciences Research Coordination Network (US-RCN) is a National Science Foundation-funded effort to develop an interdisciplinary, data-driven approach to urban research, analysis, and planning. Teams of computer scientists, mathematicians, public health and education experts, architects, urban planners, social scientists, and artists leverage a unique and growing collection of data sets from public and private sources to study the effects of policy decisions, investments, urban development, and other interventions on cities and residents. The US-RCN convenes teams of researchers from over eighteen different institutions, including The University of Chicago, the School of the Art Institute of Chicago, the City of Chicago, and the international architecture and urban design firm Skidmore, Owings & Merrill. Following the network's inaugural meeting in February 2013, members of the network continued throughout the summer of 2013 to partner with other UrbanCCD projects to bring this unique approach to a vast array of research initiatives, in particular a dozen projects undertaken through the Data Science for Social Good summer fellowship program. The Eric and Wendy Schmidt Data Science for Social Good summer fellowship program (DSSG), led by Rayid Ghani, Director of Center for Data Science and Public Policy and a Fellow at the Harris School of Public Policy, harnesses the strength of data science to address projects of social importance. UrbanCCD partnered with Ghani and the Computation Institute to facilitate the first two years of the program in the summers of 2013 and 2014. Since its inception, DSSG has brought over 120 undergraduate and graduate students with computer science, statistics, and quantitative social science backgrounds to Chicago to spend 12 weeks working on project teams with partners from the non-profit and public sectors. Organizations such as the City of Chicago, Cook County, NorthShore University HealthSystem, Nurse-Family Partnership, Mesa Public Schools, Ushahidi, and Chicago Transit Authority (CTA) have provided the fellows with data and domain expertise throughout the summer. “The goal for the program was to find people who are interested in data and analytics and want to use those skills to help society,” says Rayid Ghani.